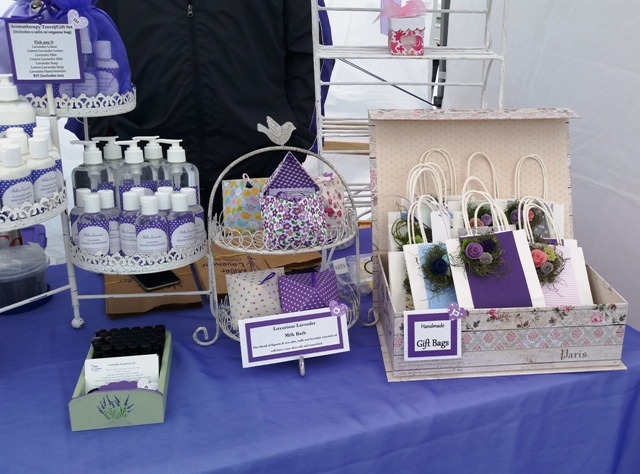 The extravagant, purple-themed decorations of Miller Lavender may catch many eyes at the Everett Farmers Market, but it’s the wonderful smells, handmade items, and “good feelings” that keep people coming back. In an interview with Kevin Mason of Miller Lavender, who sports a memorable purple beard, Everett Farmers Market takes the opportunity to learn a bit about one of its most aromatic vendors. 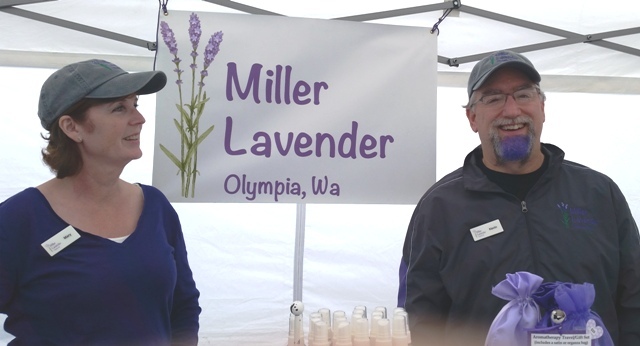 Everett Farmers Market: How long has Miller Lavender been at the Everett Farmers Market? EFM:What do you like about this market? KM: It’s five minutes from our house. We live in Everett. That’s one of the things. EFM: And do you go to other markets? KM: Yes, we also go to the Edmonds market. And my mother-in-law [Barbara Miller], who actually started the business, goes to the Olympia market. EFM:Is your business a family business? KM: Yes, it’s my mother-in-law [Barbara Miller], myself, my wife [Mary Miller Stephens], and her granddaughter, Claire. EFM: What’s your business like? KM: We don’t sell lavender but we will sell some bulk lavender, but that’s a very short season, because we use all the lavender that we grow in our products. EFM: When it’s growing season, do you all go out there and help harvest? KM: Yeah, we harvest on occasion, but it’s a really short period. Usually July and August. EFM: Do you see a lot of other people doing what you do? KM: No, a lot of markets only have one person in our business. There’s usually only one [lavender goods vendor] There is another Lavender farm up there [near Olympia], but that’s pretty rare. We don’t sell the same things. They sell slightly different things than we do. At a lot of farmers markets they only have one vendor that does what you do. EFM: How did your business start? KM: My mother-in-law. She does all the sewing, and she was sort of running out of ideas for new products, so we started helping her by making some of this stuff. We started helping her, then once we were producing all of these products [lotions, scented mists, soaps, etc.] for her, we [thought], ‘oh we should just start doing it up here.’ [My wife’s] mom’s been doing it for ten years, maybe twelve. EFM: Does your mother-in-law have a shop, or does she just do farmers markets? KM: There’s a farmers market down in Olympia that’s kind of like Pike Place where it’s a permanent structure. And they go four days a week. She’s a vendor there. EFM: Are your customers generally local? KM: Yeah, and we get people from New York who want to buy something from Washington. Washington’s known for Lavender, especially over on the peninsula in Sequim. They have a lot of really large lavender farms up there. EFM: Your stand is very appealing to the eye. KM: Oh thank you. We’re consumers too, so we know what we like when we go look at someone’s booth. We think, ‘how does this look to us?’ We’ve had no professional training of any kind in this area, so it’s kind of hit or miss. Every time we set it up, it’s different. EFM: Besides helping run this business, what do you do? KM: I’m a CPA, and my wife’s an attorney, a public defender. We had started doing it to help our mom out, and then we thought, ‘we could do this, and it would be fun’ and we were right, it is fun. And coming to markets is fun. Our stuff is pretty reasonably priced, we don’t have anything that’s expensive here, so everyone who comes here can buy something. And what we sell is fun; everyone who leaves here is happy. 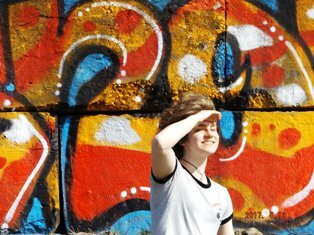 We sell happiness and good feelings. Kara is a Junior in High School and recently enrolled in Running Start at Everett Community College. She is very involved in the music program at Everett High School, as well as the Drama program and Girl’s Wrestling. During the summer, she enjoys spending time with her friends in the sun, baking, playing music, and begin a writer for the Everett Farmers Market.